Melania Trump and son Barron welcomed the official White House Christmas tree November 20. It is a time-honored tradition. A military quartet played holiday tunes. A horse-drawn wagon carried the tree from Wisconsin up the White House driveway. It is a 19 1/2-foot Balsam fir. The first lady wore a red turtleneck. She also wore a coat draped over her shoulders. Eleven-year-old Barron wore a dark suit coat. He also wore a white shirt and dark slacks. They circled the tree and then visited with growers Jim and Diane Chapman. The Chapmans own a Wisconsin Christmas tree farm. They won an annual contest sponsored by the National Christmas Tree Association. "This is a beautiful tree. Thank you so much. We will decorate it very nicely." That's what the first lady told the Chapmans and other family members. "I hope you can come and visit with us." The White House grounds superintendent and the chief usher picked out the tree during a September scouting trip. Mrs. Trump and Barron gave their symbolic approval. Then the tree was carefully carted off to the Blue Room. It took center stage there. That happened after a slight trim and the removal of a huge chandelier. President Donald Trump has been eagerly waiting to celebrate a Trump Christmas at the White House. During last year's presidential campaign, he railed against the habit of saying "Happy holidays" instead of "Merry Christmas." Invitations to dozens of holiday parties hosted by the Trumps are going out. The subject line of one emailed invite references a White House "Christmas reception." But the language of the invitation itself refers to a "holiday reception." The tree for the Blue Room usually arrives the day after Thanksgiving. But it was delivered early this year to accommodate the Trumps. They spent the holiday at their Mar-a-Lago estate. It is in Palm Beach, Florida. While the Trumps were away, a small army of volunteer decorators and florists from around the country will came to the White House. They spent the holiday weekend transforming the 132-room mansion for Christmas. There is a tree in every public room. The White House kitchens will go into overdrive preparing all the food that is typically served at the parties. Those foods include cakes, cookies and pies. There is also a gingerbread White House. It is never eaten due to health reasons. In recent years, cookies in the image of former President Barack Obama's dogs Bo and Sunny. Those were always among the first items to be slipped into purses for the trip home. Trump does not have a pet. The White House unveiled the holiday decor on November 27. The first lady also welcomed children and students from Joint Base Andrews for a holiday arts and crafts event. The president lit the National Christmas Tree on the Ellipse November 30. How did the tree arrive at the White House? 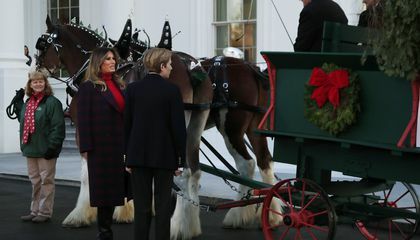 The tree arrived by carriage after it was approved by the first lady and Barron. It was taken to the Blue Room and decorated. I like how the people in the White House were being creative and they decorated the White House, and its close to Christmas so this was good timing to put the Christmas tree up. For the ceremony itself, the tree was loaded onto a wagon and pulled by two clydesdales; a comparatively light load for such strong animals. Before the tree was put onto the wagon, it had to get from Wisconsin all the way to Washington D.C. It is unlikely that they drove the tree across the country because it would have wilted significantly on its journey to the east coast. Considering the resources available to the White House and Trump's attitude towards spending and Christmas, the tree was probably flown immediately after it was cut. Such a large tree would require lots of space and was likely carefully packaged in a large wooden crate. For Christmas, Trump is getting Coal. this is a really big tree. you can see by the picture that it is too big for the carriage. Melania Trump and her son Barron got the official white house Christmas tree on Nov.20. A horse drawn carriage was dragging the tree along. Half of the tree is sticking out of the carriage in the picture.The 19 1/2 foot Christmas tree it is a Balsam fir. It was brought from Wisconsin to the Whitehouse dirveway. I think that it would have been way easier to bring it on a huge 19 1/2 semi truck. Bringing it on a horse drawn carriage was kind of a waste of time. But it is really cool to have a 19 1/2 Christmas tree in your house. 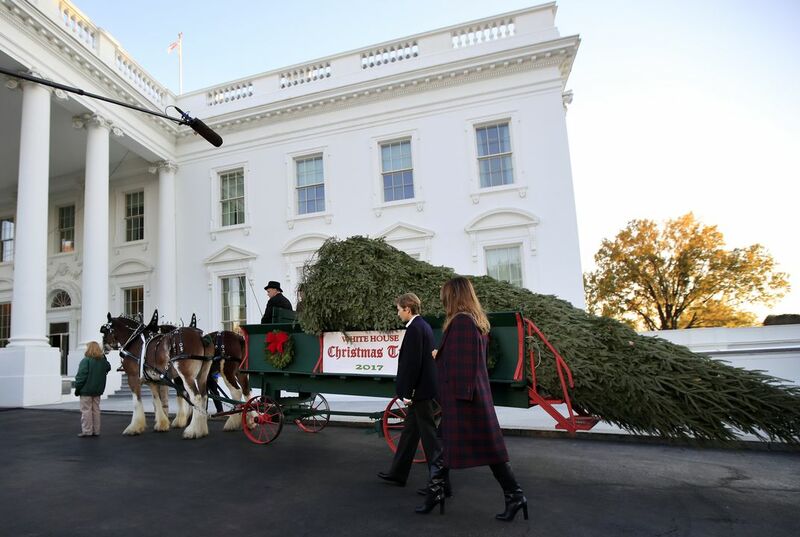 The tree arrived at the White House in a horse-drawn wagon.The wagon carried a 19 1/2-foot Balsam fir tree that was from Wisconsin. This growers of the tree had won an annual contest sponsored by the National Christmas Tree Association. Then, after it was approved by Barron and the First Lady, the tree was taken into the White House to be decorated. This is very interesting about the Presidents first Christmas tree in the White House.